Shirred fabric is wonderful to work with. It makes quick tops and sun dresses for summer. 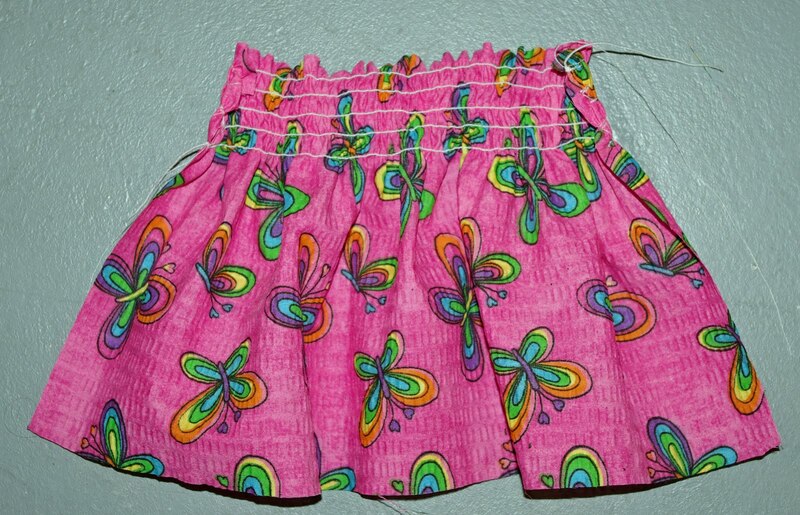 But, it can be very expensive and it comes in limited fabrics and prints. 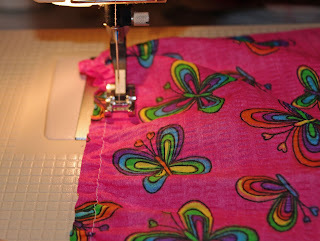 With this in mind, I was asked to write a tutorial on how to make your own shirred fabric. It's actually quite easy to do. 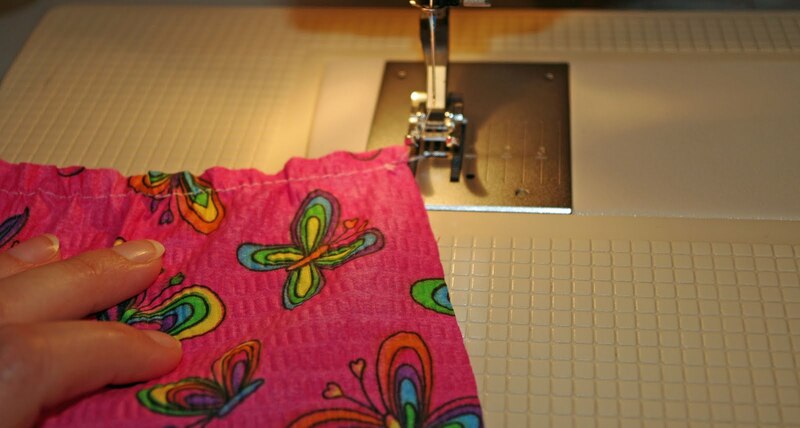 Fabric: 1 rectangle that is 1.5 times the circumference of the wearer by the length you'd like the garment to be. Hem the top and bottom edges of the rectangle. My tutorial example piece will become a top for a doll. Elastic Thread: wind the elastic thread onto a bobbin by hand. Do not pull the thread tight as you wind and do not allow it to wind sloppily. A nice and gentle wind will work great. 1. Load the bobbin into the bobbin case. 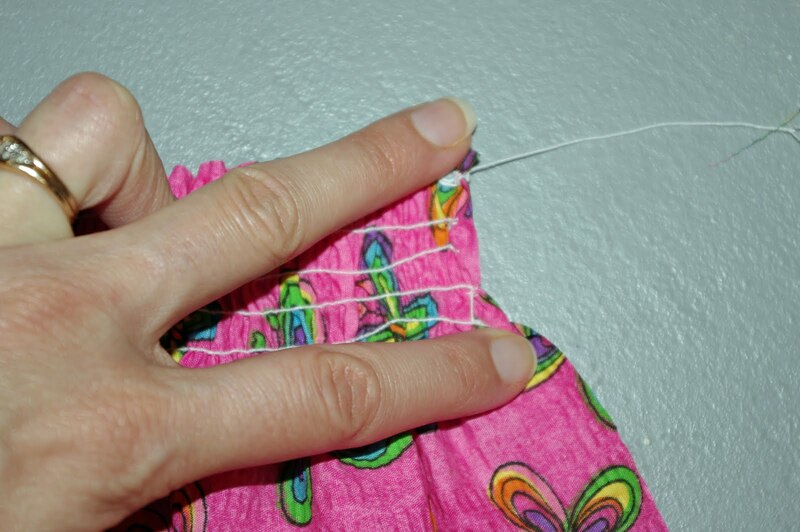 Set the stitch length to a gathering/basting length. Leave a thread tail of about 4" or so. 2. Set your presser foot along the top hem edge of the fabric. 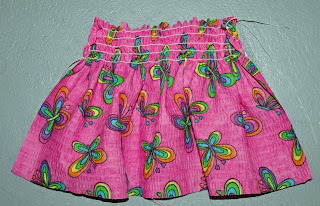 Knot/back tack about 4 times, then sew along the top edge to the other side of the fabric piece. Stop and read step 3...do not cut. 3. Knot/back tack about 4 times. Do not cut. 4. Pull the fabric out just enough to turn it around to go back the other way. 5. 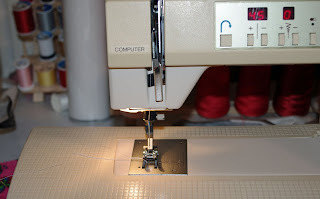 Set your presser foot down next to the first row of stitching. Knot/back tack about 4 times and sew the second row. Repeat the knot and turn steps. 6. Knot and sew the third row of shirring. 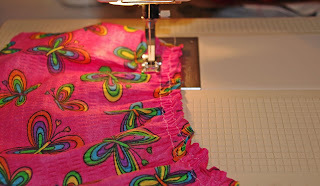 Continue the pull out/knot/sew steps until you get the amount of shirring you need for the planned garment. Knot/back tack the final row about 4 times. 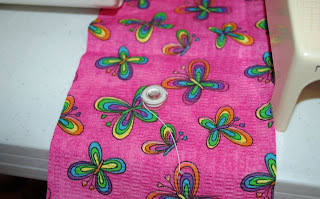 Pull out about a 4" tail and cut the threads. 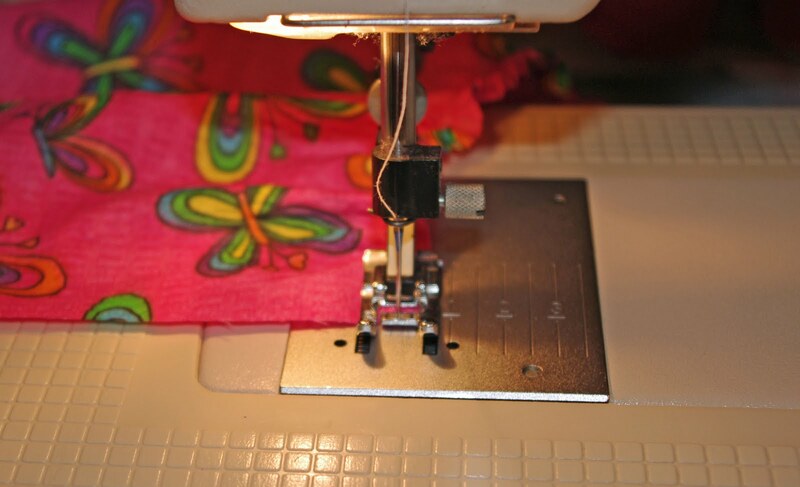 Tie the elastic thread and regular threads together securely for each side. 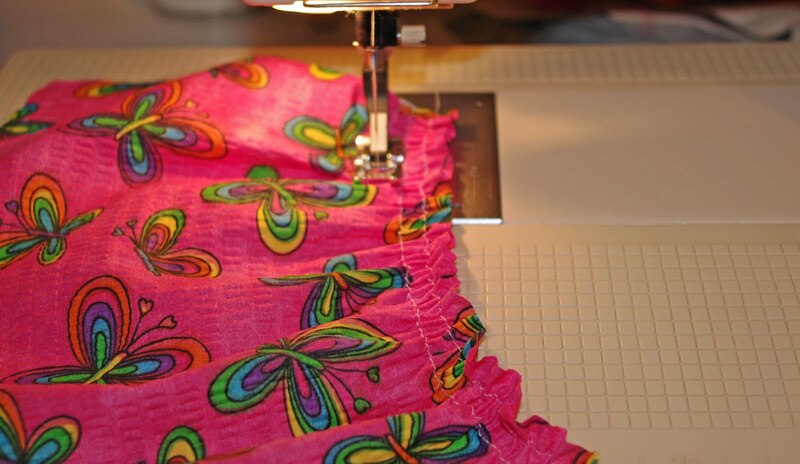 Leave the tails long until after you sew it into the garment. This shows the knotted ends of each row. If you'd like your shirring to tighten up a bit more, hit it with a burst of steam from your iron. 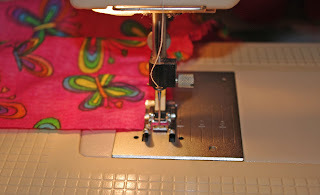 You can now put right sides together and stitch up the side seam for a skirt, top, or a dress and add some simple straps. 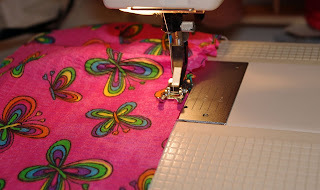 The shirring technique is nice for necklines, sleeve edges, waistbands, and empire waist details. 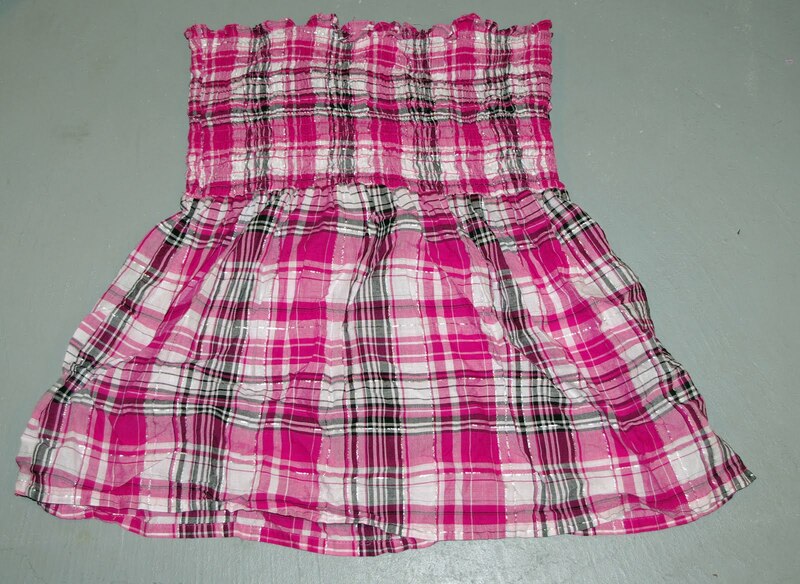 It can also embroidered and inset into a garment to resemble smocking. Oh my goodness!!!! 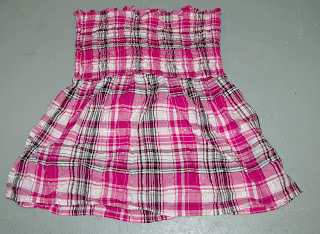 I had no idea how to do this so neatly and someone just asked me if I could make a dress like this. Thank you so much for posting!!! I cannot for the life of me get this shirring to be stretchy! It looks so cute but not stretchy at all. HELP! !